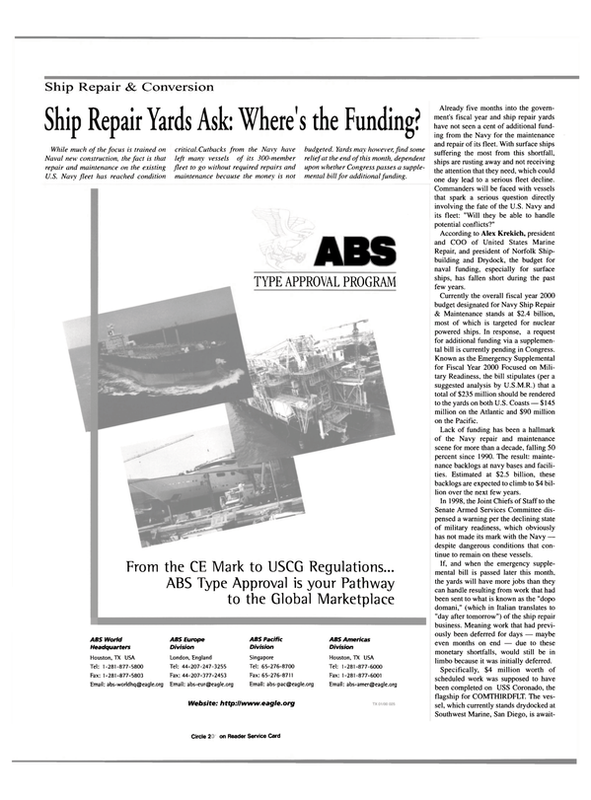 Ship Repair Yards Ask: Where's the Funding? While much of the focus is trained on Naval new construction, the fact is that repair and maintenance on the existing U.S. Navy fleet has reached condition critical. Cutbacks from the Navy have left many vessels of its 300-member fleet to go without required repairs and maintenance because the money is not budgeted. Yards may however, find some relief at the end of this month, dependent upon whether Congress passes a supplemental bill for additional funding. Already five months into the government's fiscal year and ship repair yards have not seen a cent of additional funding from the Navy for the maintenance and repair of its fleet. With surface ships suffering the most from this shortfall, ships are rusting away and not receiving the attention that they need, which could one day lead to a serious fleet decline. Commanders will be faced with vessels that spark a serious question directly involving the fate of the U.S. Navy and its fleet: "Will they be able to handle potential conflicts?" According to Alex Krekich, president and COO of United States Marine Repair, and president of Norfolk Shipbuilding and Drydock, the budget for naval funding, especially for surface ships, has fallen short during the past few years. Currently the overall fiscal year 2000 budget designated for Navy Ship Repair & Maintenance stands at $2.4 billion, most of which is targeted for nuclear powered ships. In response, a request for additional funding via a supplemental bill is currently pending in Congress. Known as the Emergency Supplemental for Fiscal Year 2000 Focused on Military Readiness, the bill stipulates (per a suggested analysis by U.S.M.R.) that a total of $235 million should be rendered to the yards on both U.S. Coasts — $145 million on the Atlantic and $90 million on the Pacific. Lack of funding has been a hallmark of the Navy repair and maintenance scene for more than a decade, falling 50 percent since 1990. The result: maintenance backlogs at navy bases and facilities. Estimated at $2.5 billion, these backlogs are expected to climb to $4 billion over the next few years. In 1998, the loint Chiefs of Staff to the Senate Armed Services Committee dispensed a warning per the declining state of military readiness, which obviously has not made its mark with the Navy — despite dangerous conditions that continue to remain on these vessels. If, and when the emergency supplemental bill is passed later this month, the yards will have more jobs than they can handle resulting from work that had been sent to what is known as the "dopo domani," (which in Italian translates to "day after tomorrow") of the ship repair business. Meaning work that had previously been deferred for days — maybe even months on end — due to these monetary shortfalls, would still be in limbo because it was initially deferred. Specifically, $4 million worth of scheduled work was supposed to have been completed on USS Coronado, the flagship for COMTHIRDFLT. The vessel, which currently stands drydocked at Southwest Marine, San Diego, is await- ing repairs on its sewage holding tank diverter valves and pumps, weapons elevators and mandatory and safety inconsistencies in necessary firefighting repairs. Is there relief in sight? When judgment day arrives — one of two things are likely to occur. Either it will be full speed ahead for the yards to begin whipping the fleet back into shape — providing that Congress and the Department of Defense work everything out. If it is vetoed, then as Krekich puts it, "we'll be going back to square one — but worse." He continued: "Sailors will get even more frustrated and there will be significant problems with ships." Whether or not Congress provides a saving grace for shipyards, the Navy, who is probably seen by some as leaving the yards high-and-dry, is in actuality, trying to plead its case at the Capitol Building.